Bass season is done now what? Throw your gear in the basement and kill time on the ice or tying flies while you wait for next season? Or how about this, your halfway thru a busy season. Do you keep plugging away with your gear the way it is? Well you could, but you should take some time to do some preventative maintenance. Like any piece of machinery, a little bit of TLC will go a long way to prevent brake downs and keep your fishing gear running at peak performance. First I start with a good clean. I use a biodegradable cleaning product to remove all the dirt and grime from the reel seat and handles. This is not just an aesthetics thing, all that dirt and grime actually makes the handle harder to grip and can even cause you to loose sensitivity. When I am done cleaning the handles I will use a product like Orange Glow to clean the rod blank and go over cork handles. This puts a bit of moisture back into the handle, preventing it from drying up. Again, I stick to natural products. If it is too harsh it may damage the cork. Try to stick to biodegradable products, they are not as harsh on the cork and finish, they are environmentally friendly, and the “stink” wont last as long on the reel (less concern of sent transfer). The next step is cleaning and examining the guides. I use Orange Glow to clean the guides then run a Q-tip around the inside of the guide to see if there are any abrasions or cracks. If the cotton on the Q-tip’s pulls, the guide is damaged and should be replaced as it will damage your line. Thats pretty much all the maintenance my fishing rods get. When I store them I make sure to remove the reels and that they do not have a bend or a load on the blank. I remember watching a friend pick up a rod that spent a season bent up against a wall, the rod never bent back. Reel are a little more time consuming. I believe that the reels should be cleaned every year, and depending on use even twice a year. 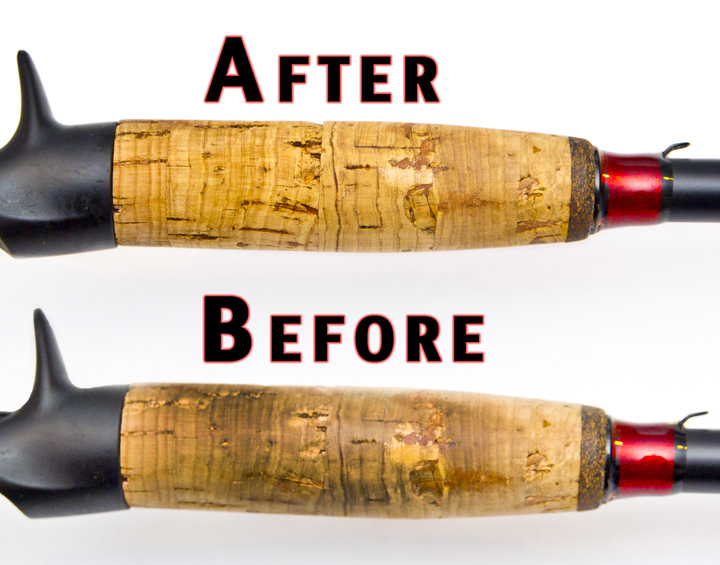 You will be surprised how much smoother a cleaned reel performs. I have opened up reels that my friends and I have bought at the same time and they never maintained them. After 2 years the amount of wear and old grease inside the reel was amazing. If you are not good with small parts and puzzles DO NOT OPEN A REEL alone. Its not to complicated but if its your first time, it can quickly get overwhelming. There are places that will clean your reels for you, if you are not confident doing it yourself, bring your reel to a pro. Throughout the year there is maintenance that you should do yourself every few trips. Open the side plate and pull out the spool, make sure that all the runners are clean and that none of the ball bearings are “oozing” anything. With a Q-tip, a toothbrush and maybe some paper towels, wipe up any of the oil and grease you see that is out of place. Take a tooth brush to the reel exterior to get out any grime or “braid dust”. You want to make sure that this dirt does not make its way into the gears while you are fishing. 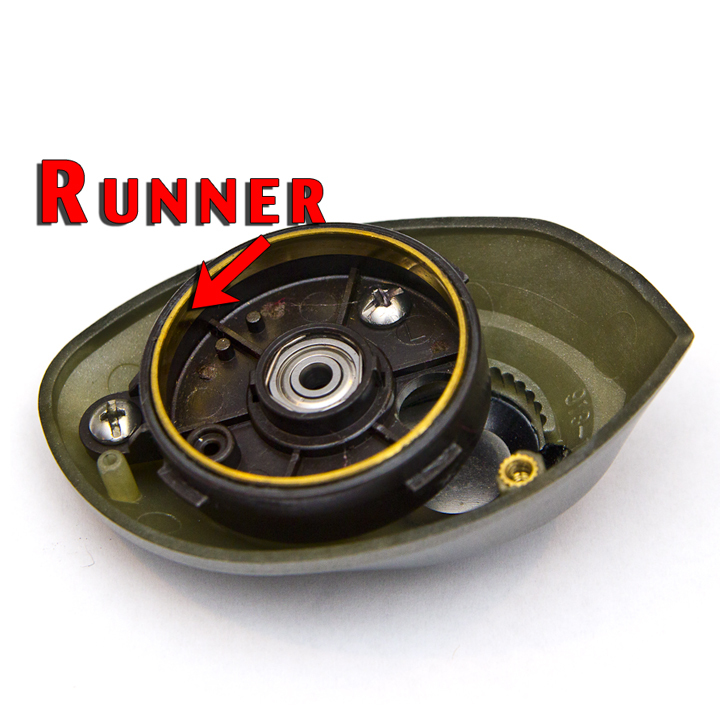 Before you put the reel back together I will usually put one drop of light oil on a Q-tip and run it along all the runners(I am going to generalize and call any part where the spool comes in contact with a static area a runner, just because it is easy to say and I treat them all the same.) I avoid adding grease or oil to the gears and shafts of my reels as the season goes on UNLESS I remove the old grease/oil first. Adding new lubricant on top of old lubricant just slows down the reel and makes a mess that can cause all sorts of problems. If it gets into your drag washers it can destroy them, especially a dry drag system. Like I said before, remove the old lubricant then add new lubricant. When it comes to selecting lubricants it is important to get a grease/oil that is made for fishing reels. WD-40 will actually break down in a reel and make a HUGE mess. I have been using the Quantum Hot Sauce lately since they claim that it is specially formulated to molecularly bond with all metal parts. Why do I like this claim? Well its true, for the most part it stays where I put it. As a general rule grease goes onto gears and in the worm shaft, and oil goes into bearings. Although I cheat and put just a bit of oil on the runners. 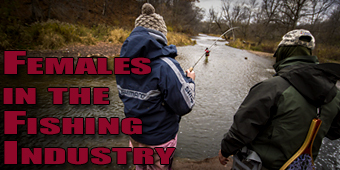 At the end of every trip you should do a once over on your fishing reels. Get out excess debris and give them a surface clean. If you are putting them away for the season give them a complete clean or send them in. If you want to try cleaning your own reel, I will be putting up a video in the future. 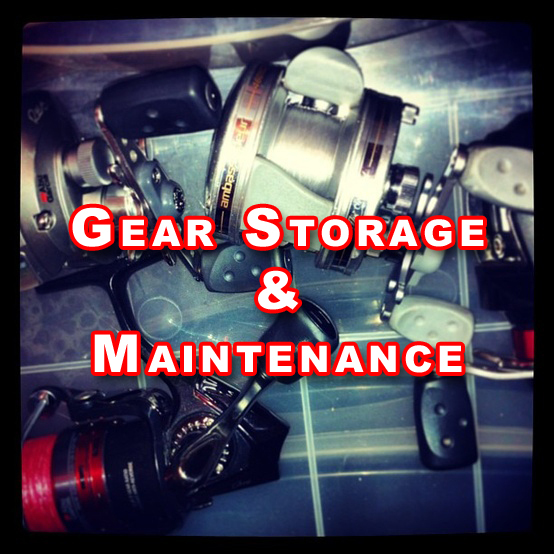 When you store your fishing reels, there are 3 things to remember. 1- Loosen the drag to relieve the pressure on the drag washers. This prevents the washers from extended periods of compression, which over time can warp the washer. This will keep the drag working at its best year after year. 2- With casting reels loosen the spool tension knob to take the pressure off the spool shaft. 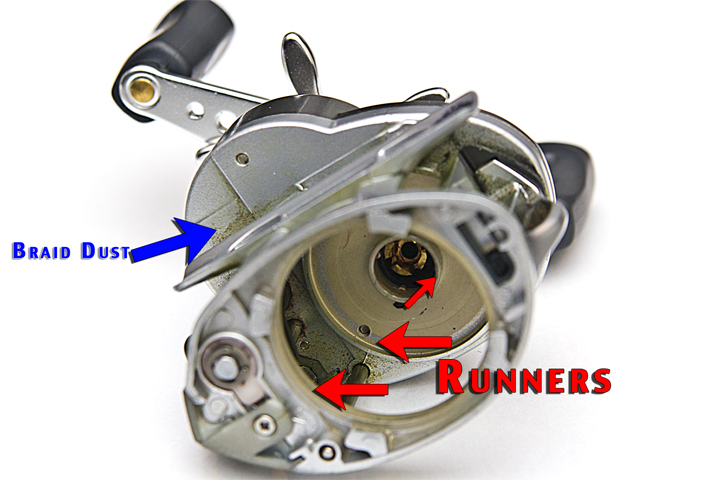 With spinning reels turn off the anti-reverse so there is no back pressure on the bearing. 3- Do not store the reels resting on the bail wire or handles. Why put more pressure on the moving parts of a reel.